Johnson, Christine. Freedom’s Price: Keys of Promise Series- Book 3. Grand Rapids, MI: Revell Publishing. 2017. As book 3 of the Keys of Promise series, I couldn’t wait to read it as I have read the previous stories and loved them. Getting a peek at the past characters again, though enjoyable, it is not necessary as this book works well as a stand-alone. 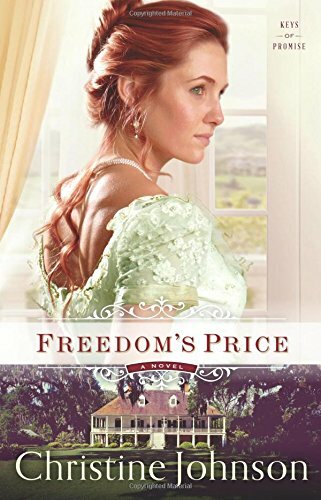 Perhaps not my favorite of the series, I still enjoyed Freedom’s Price and plan to continue reading this author, Christine Johnson. As a side note, I find the ships portrayed in Christine’s novels very interesting as she is obviously very knowledgeable about the topic being married to a Great Lakes ship pilot. Beautiful cover (again). This entry was posted in Christian Historical, Christian Romance and tagged Christian, Christian Author, Christian Book Review, Christian Fiction, Christian Historical, Christian Romance, Christine Johnson, Key West, Keys of Promise Series, Ships, Shipwrecks by Savurbks. Bookmark the permalink. Wow…I am so blessed and thankful! (I apologize for the late response- we were out of town.) I am speechless but so appreciate the smile you put in my heart by this honor! Thank-you yet again! Aww, you are so welcome! No problems, I was late responding when I got mine, too! I’m happy I was able to make your heart smile, that makes my heart smile, too!